My heart has been so heavy thinking about all of the lives saved and lost in Oklahoma from this weekends tragic event. As a christian I find it so hard sometimes to wrap my head around how God could let things like this happen to innocent children and families. The only thing that keeps me at peace and makes me realize what were really living for is that our bodies are not our bodies. We’re borrowing them. We have souls and there is a better place for them to rest and live, in heaven. I know for certain with all of my heart that there is a heaven. This is the waiting room! We’re all just trying to get to heaven! Some people just get there quicker than others. It’s the only explanation in my mind. Our God is an awesome God through the good and the bad and in the end it is all going to make sense. 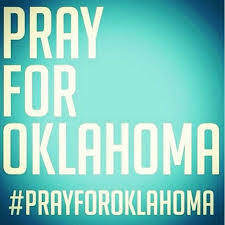 Oklahoma we are praying for you. Simply text REDCROSS to 90999 to donate $10. Ayesha – Thank you for this beautiful post. I agree that there is a heaven and that God is good. We all need to have faith, pray for each other and trust in God. You are so inspirational Ayesha. I truly believe in God our Father. Praying for Oklahoma. I believe in heaven as well. Thank GOD this earth is not our home. These tragedies make me very prayerful. So well said! All we can do is continue to pray! Have you read “Heaven is for Real”? I think it’s by Todd Burpo or something like that. Easy reading–older children could read it–but incredibly powerful. A true reminder that this is not all there is–not even close; and Jesus really IS. I remind myself often that I need to revisit this book, especially when heartache and questions arise. I am definitely going to pick up this book, thanks! Lana – Thanks for recommending this book. I will definitely get it. We all need an occasional reminder. Glad to turn more people on to this book! It is simple but profound and impacting. I need to buy another copy as I lent mine out ages ago. I’ve seen it everywhere–Costco, Walmart, b&n, amazon. I think I just noticed a new “daily reading” version out, with added comments/encouragements, but I would definitely recommend reading the original first though.